Get more for your wedding! 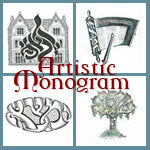 Don't forget to mention ChossonKallah.com when visiting Artistic Monogram. He did my bentcher design. it was absolutely stunning. I really recommend him to anyone for beautiful monograms for invitations, and bentchers. He does it. And does it good. I had my wedding monogram done by artistic monogram and he did a wonderful job!!! very patient and very reasonable price. Thank you very much! I highly recommend!!! Get a gorgeous set of custom-made cufflinks made with your wedding monogram, when you order your monogram at Artistic Monogram.